April 14, 2012 -- Steve Torrence did not improve his quickest Friday night elapsed time during Saturday’s final two qualifying sessions, but it wasn’t necessary. Neither could any of the other Top Fuel drivers entered in Sunday’s 4-Wide NHRA Nationals at zMAX Dragway in Charlotte, N.C.
A very happy Torrence savored earning his first No. 1 berth in his 53rd Top Fuel start and in only his eighth race in the Torrence Racing/Capco Contractors Inc. dragster. That run to remember was 3.799 seconds at a career-best 322.34 mph. Torrence and crew chief Richard Hogan assembled a solid crew last year and the team ran three of the last four 2011 events to help them prepare for the 2012 season. Their objective is to be competitive with the front-running teams. And it appears they are. Torrence started 11th two weeks ago in Las Vegas and advanced to the semifinals for the first time this year. Joining Torrence in the first-round quartet are Pat Dakin (No. 16 qualifier), Bob Vandergriff (No. 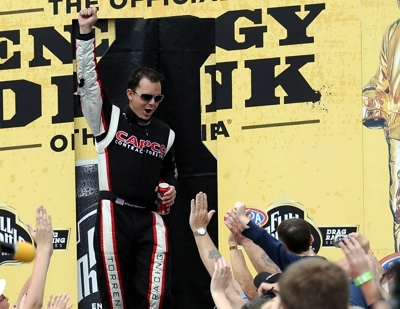 8) and Clay Millican (No. 9).